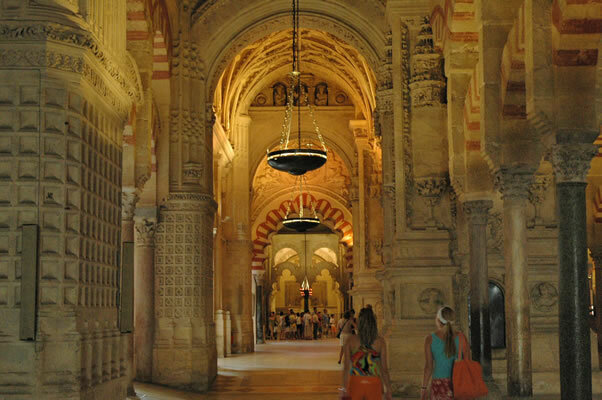 Before the expansion of the Cordoba Mosque made by Almanzor, this aisle was at the center of the mosque and led from the Orange Tree Courtyard to the mihrab. First, the Abd al-Rahman I's mihrab; then to Abd al-Rahman II's mihrab and finally, to the present mihrab of the 2nd expansion of the mosque in Al-Hakam II's phase. Directly to the left is the gothic/renaissance choir, making this aisle a stroll through Spain's architectural history from the 9th to the 17th centuries.